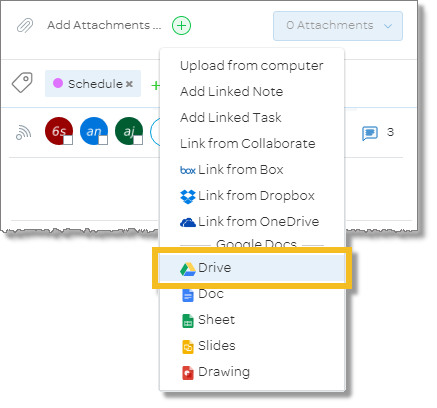 Add Google Docs, Sheets, Slides and Drawings to a team workspace, where any member can access them. Attach any file from Google Drive to a task, and assign it to someone for review or edits. In the workspace messages panel, click the Attachments icon. If prompted, login to Google. 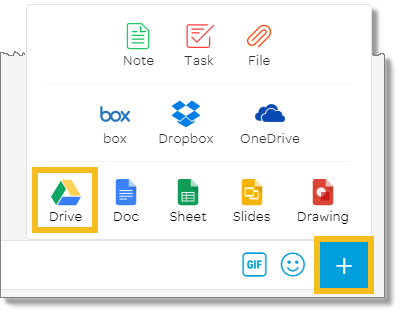 Select the file from Google Drive. Click Select. The file is added to your workspace. 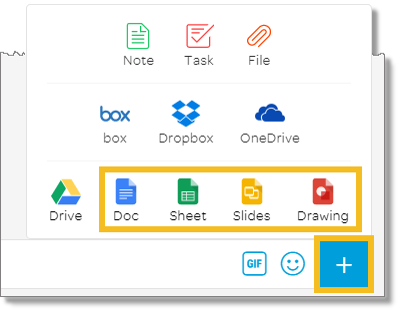 Select any of the four Google Doc types (Doc, Sheet, Slides, or Drawing). If prompted, log in to Google. In the Create new Document window for the Google Doc type, enter Title and Description, and then click Create. The Google Doc is created in the workspace. When you’re done editing the Google Doc, click Close, or click Share to share the file with other users. In the panel at the upper-right, click the Tasks icon. A list of tasks appears. Select the task you want to add a Google Doc file to. Next to Attachments, click the Add icon . From the menu, select Drive. Click Select. The file is attached to the task. The first time you sign in using Google, a Sign in-Google Accounts window appears. From the list of accounts, select your Google account.